Tried DeepSkyStacker and I think I’ve found a better and faster way of processing my images. I had been using IRIS for the better part of the last 6 years, and I remember how impress I was at the results compared to the early versions of Registax for deep sky images. While IRIS is quite manual and command-line based, it nevertheless got the job done and allowed me to experiment with different methods. But now, I decided it was time to move on to something a little modern. I looked at what others were using, and came across DeepSkyStacker. 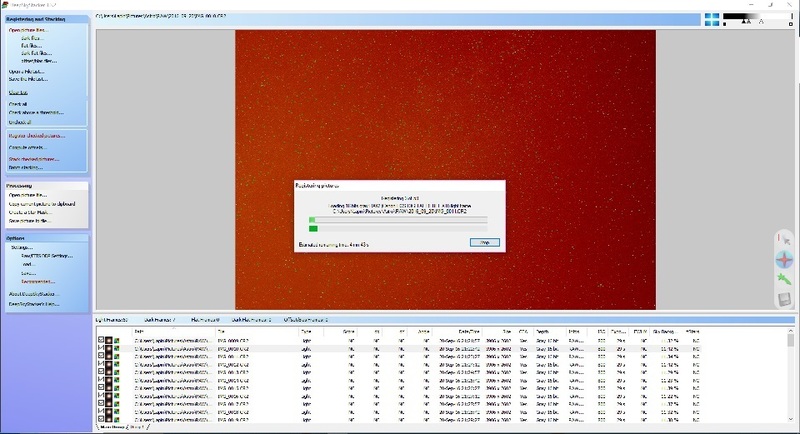 While IRIS offers a complete package, from image acquisition, pre/post-processing, and analysis tools; DeepSkyStacker only performs the registration and stacking. But it does so in a faster and more efficient way. DeepSkyStacker can fully utilise RAM and multi-core processing; hence what took 30 minutes in IRIS is now down to 5 minutes in DeepSkyStacker. It also automates many steps, and you can even save the process and create batches. So it’s down to load all your files, and then one click to register and stack. For the stacking, I found that selecting RGB Channels Background Calibration provided good color, and used the Kappa-Sigma clipping to remove noise. After stacking DSS will create an Autosave.tif (32-bit TIFF file). I need to convert this into another format, but without loose the dynamic range. My current solution is to use Microsoft Photo Gallery to open and save another copy as JPEG. Finally did a quick stretching of the RGB levels to ensure better dynamic range when saving to 16-bit TIFF. 16-bit TIFF appears to be the only one that will open correctly in IRIS. Once in the image loaded in IRIS to remove the background sky gradient. And then save it in BMP format for import into GIMP. Yes I know I another file format, so far it’s what I find works best. GIMP converts FITS and TIFF to 8-bit, causing incorrect color depth. Final adjustments with levels, light curves, saturation, noise filtering, etc.. is done in GIMP. Now for a little more playing around, and trying it on some on my older pictures. DeepSkyStacker saves files in 32-bit TIFF by default. After stacking many images the dynamic range is quite large, and this is not data we want to loose. But the problem was finding a program that was able to correctly handle the 32-bit file format. The next release of GIMP (version 2.10) will handle 32-bit files, but GIMP 2.8 was limited to 16-bit and even there it would convert the image to 8-bit for manipulation (GIMP 2.9.2 and up might work, but needs to be compiles on your computer – development package). Not good… Before downloading yet another photo imaging software I tried some of my current programs and found that the Microsoft Photo Gallery software for Windows 10 does a great job of handling the 32-bit TIFF files. Once the image opened, under File – Make a Copy I save a version in JPEG. Yes I know not ideal, but I avoid a lot of the quantization conversion error and I’m able to continue my processing in IRIS and GIMP. This entry was posted in Image Processing, Tools and tagged Astrophoto, Astrophotography, DeepSkyStacker, Image Processing, Software by Benoit Guertin. Bookmark the permalink.